A full range of Elise parts from oem manufacturers are available from Hangar 111 for maintaining or repairing your Elise as well as tuning accessories that give you upgrade options when it comes to replacing parts. Selecting the correct parts for your Elise is essential to keep the car performing at its best on both the road and track if that is where your Elise is destined! Since the birth of the Elise in 1996, the little soft-top sports car has been through many changes including refinements for road driving and high performance models that are designed for the track. Rover K-Series and Toyota 2ZZ and 1ZZ engines have been used with various parts added or modified by Lotus on the production line to make them model specific. As many variations of the car have been developed using a variety of Elise parts for upgrading performance, the vehicles need a reliable source of spares. We are specialists in this area and have available a wide range of Elise parts to service and repair your car the way Lotus intended. Whether you run your car on the road, track or a competitive driver you will need a source of high quality, dependable original equipment and performance parts to ensure the best performance. 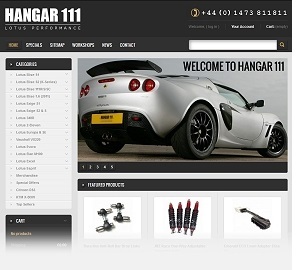 Hangar 111’s aftermarket stocklist of Elise parts is compiled from years of experience. We understand how important it is to get the right part that fits correctly, is designed specifically for the Elise and can be relied apon to deliver good performance when used. When we choose Elise parts for our customers we take into consideration things like reputation of the supplier, quality of their products and most importantly fitness for purpose. This is where customers who choose to purchase their Elise parts from Hangar 111 benefit from our years of supplier experience and workshop knowledge that gives us a clear picture of which Elise parts are durable and reliable and those which do not! The Elise is a very special car and most importantly requires specialist care and attention to detail. As well as our online parts store, our full range of workshop services are available at our location in Waldringfield (near the towns of Woodbridge and Ipswich in Suffolk). Some video of our Elise 111R Production race car racing at Spa.